What are your thoughts on this team? Obviously it’s always incredibly difficult to try to identify 12 players from a group of so many great players. The committee had a really difficult job this year, because it’s the first time in a long time that a lot more than 12 players could easily have been named to that team. But the 12 that were named are a great combination of Olympic gold-medal experience, multiple gold medal winners and great leaders. There is also an influx of young players, which not only is going to be a great benefit to us this year, but I think it will set the stage going forward in two years for the (FIBA) World Championship and then in four years in Tokyo. They will be the future of the USA Basketball Women’s National Team. I thought the committee had a tough job, and I think they did a tremendous job of accomplishing a lot of things. What does it mean for you to be a member of this team and to play in your third Olympic Games? It means a lot. To get one is awesome but to get three and to have the opportunity to win three gold medals is like putting it up there with some of the greatest women’s basketball players ever. So, I’m just thankful that I’m in the position of being on the team again, and I get a run at another gold medal. What can you do to help the USA win a sixth-straight Olympic gold medal? Consistency and dedication. If you think about this last camp that I came to (Feb. 21-23, 2016) I wasn’t 100 percent, but after talking to Carol (Callan) and to Geno (Auriemma) and Ed (Ryan, the team’s athletic trainer) and everybody, I came out and gave everything I could. And they always know that whenever I’m on the floor I’m going to give 100 percent, no matter what. I’m going to do whatever is necessary to help our team be in a position to win. And I’m one of the older players on this team, so I can add that veteran leadership and that bond. Me, Diana, Sue and Tamika have all played together before, and that camaraderie kind of comes in play to help us win. You were one of the youngest members of the 2008 team, who did you get advice from and what can you offer the younger athletes on this team? Katie Smith was that person for me. I just remember her pulling me to the side and basically saying, ‘You know one day you’re going to be in my shoes as far as being out here and being able to help the team in any way possible.’ She told me to stay consistent with my game and understand that everything is a process. Especially with USA Basketball, the younger players, it’s a learning experience, and we have to grow under the wings of players like Katie Smith and Lisa Leslie and those guys. It just worked out for me that I was able to be around her, and I hope to be that type of player or that person for some of the younger players on our team for this year, or years to come maybe. I’d like to keep this tradition alive, just try to pass along to the younger players like Katie Smith did for me. What does it mean to be named to your fourth U.S. Olympic Team? It actually means a lot. In some ways it has even more meaning than the first three. Mainly I think it’s because that when you are young the tendency is to take things for granted, and you just think these things are going to happen year after year or every four years. But now that I am older, I see that I am really lucky. Really lucky to be here, and I’m really excited and honored. And I’m just looking forward to it. 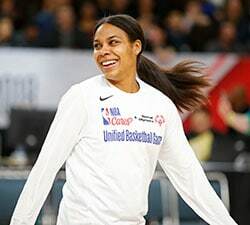 You and Teresa Edwards are the only two USA Basketball athletes on eight teams for international majors – Olympic Games and FIBA World Championships. Could you ever imagine being up there in the history books with someone like Teresa? No, not at all. That’s pretty crazy to be honest with you. She is definitely the benchmark when it comes to wearing the USA jersey, representing your country and being successful on that level. So, to be in that same conversation as her is pretty incredible. I definitely never thought that would have happened. And that kind of touches upon what I was saying earlier, when you’re younger, you’re just kind of going through it. But now that I’m older I do realize just how fortunate I am to have had these opportunities. What does it mean for you to be able to play alongside Diana Taurasi and for coach Geno Auriemma one more time? Obviously with Dee being on the team, we have gone through so much together both as friends and as basketball players, and it’s always a great time whenever we are on the same team. I really look forward to that. And the same for coach Auriemma. It’s not often that you get to play for your college coach again. And now I’m going to have a fourth opportunity to do that, and the second time at the Olympics. It’s the biggest stage, so it’s pretty exciting to be with both of them. You started playing for USA Basketball in 1996 and are getting ready to play on your last team this summer. What does that mean to you? Wow. It’s absolutely amazing and definitely an honor to be able to represent the USA one last time, especially knowing from the beginning, where I started on the junior team and my goal of being an Olympian. And now here I am with the opportunity of being on a fourth Olympic team. I definitely would never have dreamed that, but it is definitely so rewarding, and I’m just honored. I truly am honored. With your fourth Olympic team selection, you are among the pantheon of women’s basketball athletes. Prior to 2016, only Teresa Edwards (5) and Lisa Leslie (4) have been on four Olympic teams. What are your thoughts on that? To even have our names be in the same sentence with those two, it’s just amazing. For me, Lisa and Dawn (Staley) and Sheryl (Swoopes), that era right there, those were the people that I looked up to. And with Teresa, being able to develop a great relationship with her, just to be mentioned in the same line, all the great things that they did in their careers, it’s just one of those things where you’re just in awe. Now you’re in such a prestigious group, where it used to be two and now there are five of us who will be able to go through that. It’s definitely so rewarding. It’s such a blessing. Take us through your journey from being a rookie on the USA National Team to now being a veteran athlete. How has your role changed and what will you pass along to the rookies this summer? The person I learned from the most was Dawn (Staley). Until I was around her I never really knew from a player’s standpoint what a true leader was. I’ve had people around me who have been great and helped guide me, but as far as my first time with the USA senior team, it was definitely Dawn. She taught me how leaders carry themselves, how leaders are able to bring all different players together to focus on one goal. I think that that’s the same thing for Diana (Taurasi), Sue (Bird) and I. I look at it myself more so, because I know I am done. I don’t know what’s going on with them, but really the passion that I play with, how hard that I play, the effort that I give … I always try to give 110 percent. Being professional, representing the USA, the way we carry ourselves and the way we act, every single thing about us plays into, whether we’re with the USA team or whether we are with our own WNBA teams or overseas or whatever the case may be, I’ve always told our Olympians and I’ve always told our players, once you’re on this Olympic team you represent the USA no matter where you are. That is a huge responsibility. For me when I walk away, the way that I played and the way that I worked with every single player who’s come through that USA Basketball family, I just want to be known as a great leader as far as caring about everybody and doing what I’m supposed to do on the court and off the court as well. What does it mean for you to be named to this team? For me it’s a blessing to be one of the 12. I don’t take anything for granted. I respect all of the finalists who were in the pool. There’s a lot of great talent, and it could’ve gone either way. I’m so blessed and super happy, and I appreciate the fact that I’m a member of this team. I’m still scrambling for words. Even though I’ve already earned a gold medal and I’ve had that experience, anything can happen. Looking at the amount of talent that comes into this league that USA Basketball knows of, anything could’ve happened, so I’m blessed. It’s awesome. What do you bring to the team, how can you help the USA win a sixth-straight gold medal? As far as that goes, I’ll say consistency. Whether it’s to run the floor hard, rebound, whatever is needed of me, I am going to do to the best of my ability. I believe that I’m very coachable, and I know coach Auriemma’s system and what he expects out of his players. So having that mindset and going through the training camps and being coached by him since 2010 when I had my first USA training camp, I know what is expected of me. And I will try to do that to the best of my ability. What does it mean for you to play for coach Geno Auriemma again? It is amazing. Coach Auriemma, he is a great teacher. His formula is to make you the best, and he gets the most out of every player and he just gets the best out of them. It’s an experience that I’m really glad that I can have again at this level. Both of us received our first gold medal at the same time at the 2010 Worlds (FIBA World Championship). And to be able to have that experience with him again, it’s going to be really sweet. More than anything I’m looking forward to the camaraderie with the team. The camaraderie is what I look forward to the most, to have that group of 12, that talent, you’re able to learn from a lot of people, both off and on the court. So just to have that camaraderie, and knowing that it could be a couple of the players’ last go round, just to soak it in and have a good experience with them. What does it mean for you to be on the U.S. Olympic Team? It’s so hard to even put it into words. When Carol (Callan) told me, it was emotional. Just to think this entire basketball journey I’ve been on has been absolutely incredible, but this has been by far the pinnacle of my career and the best news I’ve ever heard. It’s absolutely a dream come true. I’ve just been soaking it up today and it’s amazing and a humbling experience as well, with how special and talented this pool of players is. You have had a pretty interesting basketball journey, from stepping away from the game, to reemerging to becoming an All-American, the WNBA MVP and now you’re an Olympian. What has that been like for you? Yeah, it’s crazy to think that there was a time that I put the basketball down and thought I would never play again. And now to get here, it’s unbelievable. I wouldn’t trade any part of that journey, I feel like it really makes this moment that much even more special. Did you watch the Olympics growing up? I did watch the Olympics, but I would watch different things. I would watch a lot of gymnastics, swimming, beach volleyball and basketball was always on at different times. If it was on, I would try to catch it. But I was just a huge fan of the Olympics in general, all the different sports, even track and field. What are you most looking forward to about going to Rio? Definitely the competition part of it and competing for a gold medal. But, I’m also excited to meet some of the other athletes and hopefully be able to see some of the other events as well, because I’ve been such a huge fan of the Olympics my entire life. What do you bring to the team, obviously you’re a talented player, but can you pinpoint anything specific? I think I bring versatility, so I’m able to play different positions and help with whatever team we face. I can kind of move around and play whatever position is needed. More than anything, I want to be a great teammate. I think that’s what Team USA is all about, unselfish, high IQ basketball players who put the team in front of everything. How do you feel, being named to your third Olympic team? It’s very exciting. I feel blessed to have the opportunity to be a part of the team for my third Olympics. Actually when I got the call, I missed Carrol’s (Callan) call at first, so I didn’t know what the call was going to be about. Her voicemail just said to call her back. But after getting out of practice and listening to the things that she had to say, I was so happy. She told me congratulations, and my heart just sank to my stomach with joy. I am just happy to be part of this 2016 Olympic team. The pool of athletes from which to choose is very talented. Did that make you even more nervous? Oh yes! My nerves were on an all-time high. I had jitters like crazy. The pool was so competitive this year and that’s a good thing when you can actually have to sit down and stress about who will make the team or not. I’m just excited that I am one of those 12 to be named. How has your role changed from when you were a rookie in 2008 to now, as a member of your third U.S. Olympic Team? In my rookie Olympics I came in, and I had a lot of veterans to look up to. I had some great role models who helped me get through the ‘08 Olympics. And then into 2012, that’s kind of when my role switched over. You have to know exactly what the coaches want and how to get it done without getting fussed at a little too much. I think that this year I can be more vocal and just go out there and lead by example. I think I have a good understanding of what coach Geno Auriemma will want, and that’s to go out and get it done this year and have fun doing it. Just clicking together as a unit. I think we have a phenomenal group of young women, and I’m looking forward to having fun and enjoying this together as a team. How did you feel when you found out that it was official, that you were going to be named to the U.S. Olympic Team? When I got the call, I was speechless. Just knowing that this will be my first Olympics that I’ll be able to go to and play in, I’ve always said that that’s the biggest stage you could play on. It doesn’t get any bigger than putting on that jersey and playing for gold. So, I was really, really excited. How much is the international game different than in the USA and how does that suit your style of play and how you can contribute to the team? This year in Russia I really adapted to the style. It’s a really different style of play, international basketball. But playing in Russia, playing in the Czech Republic, Turkey … I have to play a little more physical, for sure. It’s a different style of play. I was able to be a threat in the paint. I was able to help my team out on the defensive end big time, so I think I’ll be able to do the same for the USA this summer, be that threat in the paint, trying to get the guards to turn their heads from driving in and definitely playing hard down low against the post players. What are you most looking forward to this summer as a member of the U.S. Olympic Team? Just playing with the girls, honestly. Every time we go to camps, like the one we just went to at Connecticut. Just being around the girls, it’s just playing with them. I don’t always get a chance to play with everybody, with all the great players in our league, and now I do. It’s the biggest reward ever playing with them, and I think that is the most exciting thing for me. You mentioned all the great players, many of USA Basketball athletes think that training camps are harder than competition because of all the talented athletes at the camp. Is that the case and do you feel you get better whenever you’re with USA Basketball? Oh yeah, I definitely think I get better every time I go to a camp and we all play against each other. Everybody’s pushing each other. Everybody always wants everybody else to be the best player. 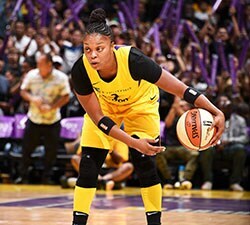 In Connecticut (in February), Catch (Tamika Catchings) really talked to me and she wanted to know how to make me a better player. Somebody that I don’t play with in the States or overseas … they take time to make sure that our sport keeps growing and each player keeps getting better. Her reaching out, and other people like Dee (Diana Taurasi), Sue (Bird), they all just want to make you better. I think that’s really what makes it a feel different. How did you feel when you found out you were going to be on your second Olympic team? I think the emotion, I don’t even know how to explain it, it’s just a gut feeling because you’re nervous about the call, and you don’t even know what you’re going to hear. But when you hear that you made the team, there’s just this feeling you get, there’s excitement, there’s butterflies and the thought that, ‘Wow! I get to represent my country again.’ It gives you more motivation and makes you want to get ready even more. Like, I want to go to the gym right now just to get ready. There’s definitely a motivation that you feel inside. What does it mean for you to have another opportunity to represent your country through basketball? You know what? It still hasn’t hit me yet. Even from the last Olympics, it’s like, ‘Wow, I’m really one of the best players in the world? I’m playing on the Olympic team?’ And then to win the gold, it’s like, ‘Wow, we really are the best. We are really some of the best in the world.’ It’s still hard to grasp. And I got to play with other great players like Diana (Taurasi) and Tamika (Catchings). It was like, ‘Wow I’m with them. I’m really here with them.’ And that is still such a humbling experience. I’m sure it will hit me soon, it will really sink in. This is just amazing. How do you think you can help this team win gold? Back in the 2012 Olympics, I was in the core group that brought energy to the team off the bench. We came in the game, and you didn’t lose that energy. Now we’ve gotten a little bit older, so that core group is definitely a little bit older, so we definitely have to get smarter. I think what I bring personally is to continually bring that energy off the bench and be a defensive stopper. And that is what Geno (Auriemma) talks to me about, me being a good defensive stopper off the bench. We have a lot of players who can score. We know anybody can score on any day on this team, so that’s not the issue. So what can I do outside of scoring is getting steals, rebounds pumping the team up, giving them that energy they need. That is the role that I have embraced and will continue to embrace for the 2016 Olympics. Your first USA Basketball trip – your first gold medal – was at the 2007 Pan American Games in Rio de Janeiro. What are some of your memories from that trip? I really enjoyed learning from Dawn (Staley, who was the head coach of the 2007 USA team). She’s one of the coaches who has really helped me grow my career. In the Pan Am Games I did not start very well. I was nervous, but she told me, ‘Angel, just play.’ And I wound up having some of my best games. So that was my first experience in an Olympic-type setting. It really helped me grow. I learned a lot, and now I am excited I’m going back to Rio. I’m 30, I’ve grown a lot, my maturity is there and I think I can really help the team on another level. How did you feel when you found out you had been selected to the U.S. Olympic Team? It’s extremely exciting to have another opportunity to play with the best players in the world. It’s just a special time in the history of USA Basketball because of the level of talent, from top to bottom, that we have with the opportunity to continue to make history with our legacy of winning gold medals. It’s a lot of pressure, but it’s an exciting challenge. I’m super spoiled to be able to have not only Geno Auriemma as my coach in college, but as a pro at the international stage. 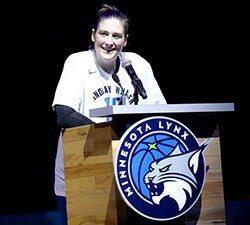 To be able to do that not once, not twice, but four times, and even Cheryl Reeve, who is my head coach for the Lynx. I’m just blessed to have so many awesome coaches around me and to be able to enjoy being around coach Auriemma for one more awesome basketball experience. In 2009 you were on your first USA National Team and you were still in college. How has your role with the USA National Team evolved since then? I definitely have more responsibility to lead and to lead by example. Even more so than when I was the youngest one on the team. I’m just trying to be vocal to help out here or there, if there are any areas where I can help things move smoothly. Mainly I try to just lead by example, even more so now in helping to set the competitive tone, share the ball and enjoy the experience. It’s not a very complicated recipe for leadership on this team. It’s really just about enjoying your teammates and competing. Well first of all when I saw that Carol (Callan) was calling, I had a mini heart attack. Because I’m like, ‘What’s going to happen? I don’t know! I don’t know.’ And then I answered it and obviously I knew who was calling, but when she congratulated me, it was … I was speechless. I did not know what to say. I was so excited about the opportunity to play this summer in Rio. Where does this rate among all your accomplishments, or can you even rate it? It’s definitely been a great year. I’ve had a lot of great things happen throughout my career, but when you look at this and when you look at the opportunity to be able to go to the Olympics, that was my biggest goal in basketball. It was the highest goal that I had set for myself. And now to be able to do that, this is definitely a year where so much has happened. Winning a fourth national championship, getting drafted, going to the Storm, and now this. It’s really amazing. I can’t wait to get going and see what happens. Are you excited about playing for coach Geno Auriemma again? I think that’s going to be great. It’s weird leaving UConn, and leaving him. I’ve talked to him a lot over the past few weeks with everything that’s going on. But to have another opportunity to be coached by him, he’s the best coach in the game, and I’m excited to be able to get back on the court with him. You’ve been playing for USA Basketball since you were 14. When did playing in the Olympics begin to feel like an attainable goal? I think that after the first time, I was 14 and I had no idea what was happening. I went out to Colorado Springs and made that team and went to Mexico. And then it’s kind of crazy to think about the fact that I’ve been able to play for USA Basketball every single summer since then, or at some point during the year, from when I was 14 to now. I’m not sure when I actually knew when I might have a chance at this, but I would say probably when I was just getting done with high school. I was a senior in high school and began to realize that this is something that I wanted to make a part of my summer every single year, and I want to continue that. As I grew as a player I wanted to continue to grow at the highest levels. What does it mean for you to be not only named to your fourth Olympic team, but to have another opportunity to play for Geno Auriemma and alongside Sue Bird? It’s an amazing honor. I love playing USA basketball, especially when I get to do it with two people that I have so much respect for. Who did you look to for advice in as a rookie in 2004? I learned from watching and listening to the older guys get it done. The way they approached each moment is what I learned the most from them. What are you most looking forward to in Rio? What does it mean to you to be able to play on a second Olympic team? It’s always such an honor to be in the pool first of all. And then to compete and make the team, to be named to the team is just the top of your basketball list. It’s what you work for since you’re a little girl. It’s the highlight and the main goal that you’ve been working for all these years, and to be able to do it twice is pretty cool. I feel pretty lucky to just be a part of USA Basketball again. I’ve kept working hard and been around great people who have continued to help me to get better and have continued to help me make another team. What contributions can you give to this team? I think as a guard, just communication and being able to provide some skills from attacking the basket to rebounding and playing as hard on defense as I can. Just having been a part of USA Basketball for a lot of years, going back to the under-20 team, just the familiarity and understanding of what it takes to play international basketball and to know what is expected and how professional you have to be. In 2010 when I made the team and played in the Czech Republic (at the FIBA World Championship), I understood what it takes and what you have to do to prepare to be ready. I’m just thankful that I have the opportunity again this year to play again. It’s really cool. It’s kind of crazy that that’s where it started. That was the first team I made. The first gold medal was in Brazil, and now we’re going back. I do remember a lot about that trip. I remember the hotel, walking to the store a lot. I remember my teammates and the kind of team we had. We were really successful. We had a great group. Marsha Sharp was our coach, and I remember a lot of good things about that trip. I remember the Brazilian barbecue, which was really good, and I bought a Brazilian soccer jersey there, or futbol as they call it, because they had just won the World Cup. It was just really cool. It was one of my first experiences outside of the United States. The year before I went to Europe with the Big 10 (Conference All-Star Team), and this was my second time ever outside of the country. To be able to take in all those experiences was really awesome. I learned how to compete at that level and learned what it took to be successful, and I can’t wait to go back to Brazil this summer.